For the past few months, we have been working nonstop on commissioned lamps and have not had time to create new showroom pieces. 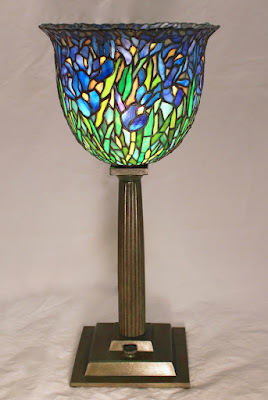 Because of this, our selection of showroom lamps has recently dwindled down to just a couple of stained glass pieces. 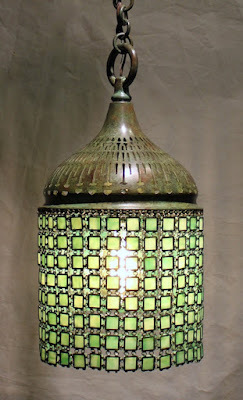 To enhance the selection of showroom examples, we have brought in a number of lamps from our private collection. Most of these pieces will only be available for a limited time. 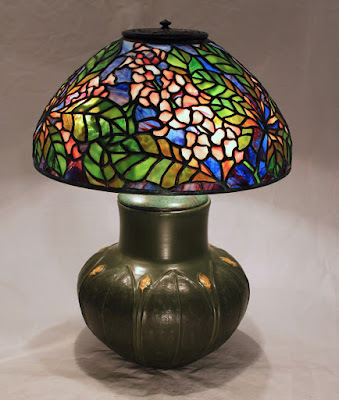 The collection of lamps varies in size and style. 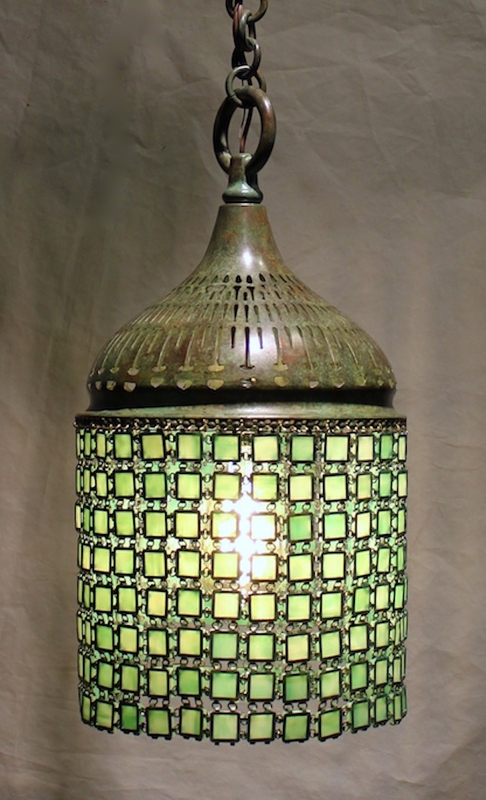 Chain Mail Lantern – This hanging fixture is 9″ wide and has 8 rows of chain mail. The fixture is shown at 33″ in length, and can be made longer with the addition of more chain. The minimum length of the fixture without any chain is 25″. 9″ Iris – This is a Century Studios original shade design. This torchiere style shade is covered in delicate Iris flowers clustered together in a impressionistic burst of color. The shade is shown on the Doric Column Torchiere base. 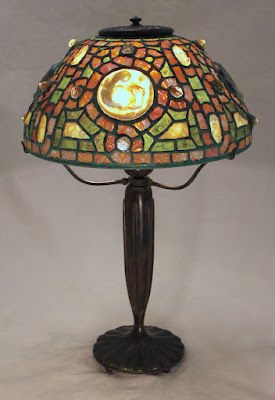 12″ Zodiac – This is a Century Studios original shade design. The design uses motifs found in Tiffany Studios Zodiac Desk Set pieces and larger Tiffany Zodiac shades. Decorative borders intertwine across the surface of the shade which is also studded with small three dimensional pressed glass jewels and our large round turtleback jewels. Heavily rippled glass was chosen for the borders which, in combination with the jewels that stud the surface, gives the shade a sparkling three dimensional aspect. The Zodiac shade is shown on the elegant Torpedo base. 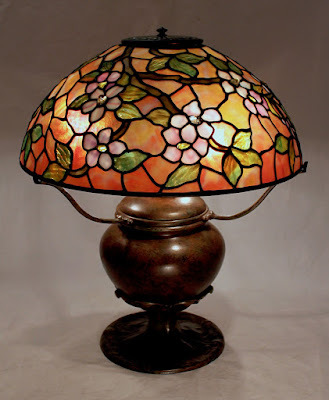 14″ Chestnut – This is a Century Studios original shade design. The lively colors of the leaves and flowers are set against a vibrant blue sky tinged with purple and wisps of white giving the shade a fresh appearance. The shade is shown on the Leaf and Bud w/Collar Pottery base. 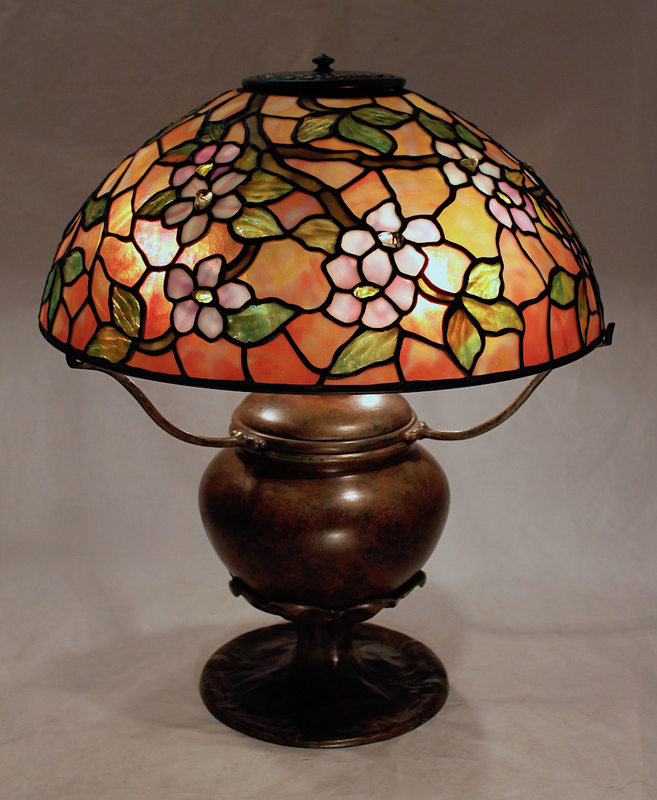 16″ Apple Blossom – The warm orange/amber background glass of this shade was selected from old Oceana 900 Series. Available for only a brief time many years ago, 900 Series was an unusual glass that looks opaque when unlit, and becomes sparkling and transparent when illuminated. 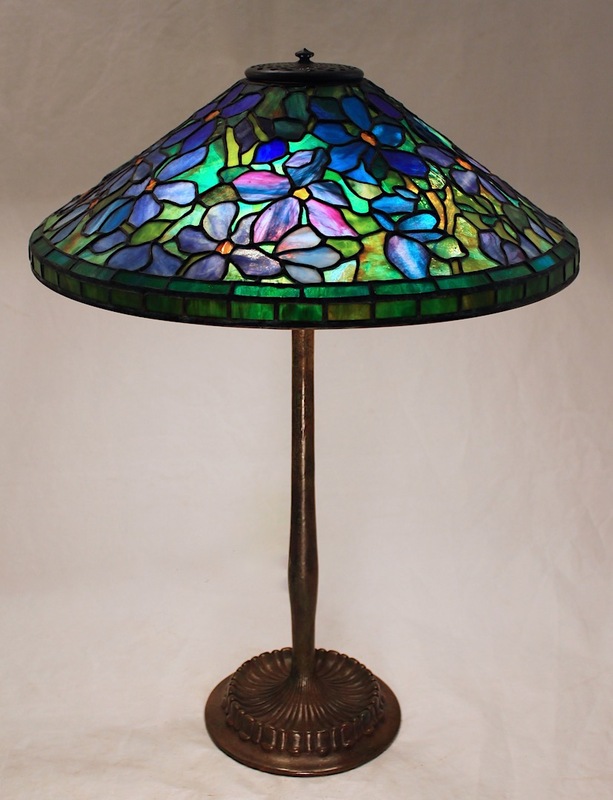 This shade has three dimensional “jeweled” flower centers. Bill hand-chipped and faceted thick chunks of amber glass until they were the size and shape needed for each flower center. This unusual technique, in conjunction with the rippled leaf glass, creates a look of movement and interest in the shade. The shade is shown on the Flower Petal (w/arms) base. 18″ Clematis – This beautifully designed Tiffany shade has a non-repeating pattern and is covered in large flowers. Purple and blue flowers tinged with fuchsia are set against a green fracture glass background. In addition to ring mottled and streaky glass, rippled glass appears throughout the shade in the flowers, leaves, and flower centers. Much of the glass used for this shade was made by the Lins and Schlitz glass foundries. 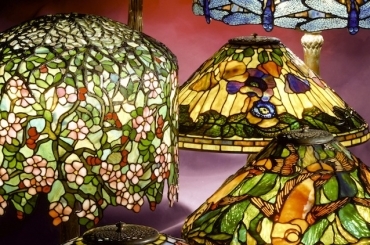 Both of these glassmakers ceased production in the 1990’s, and their glass is highly prized. The shade is shown on the tall Grooved base. 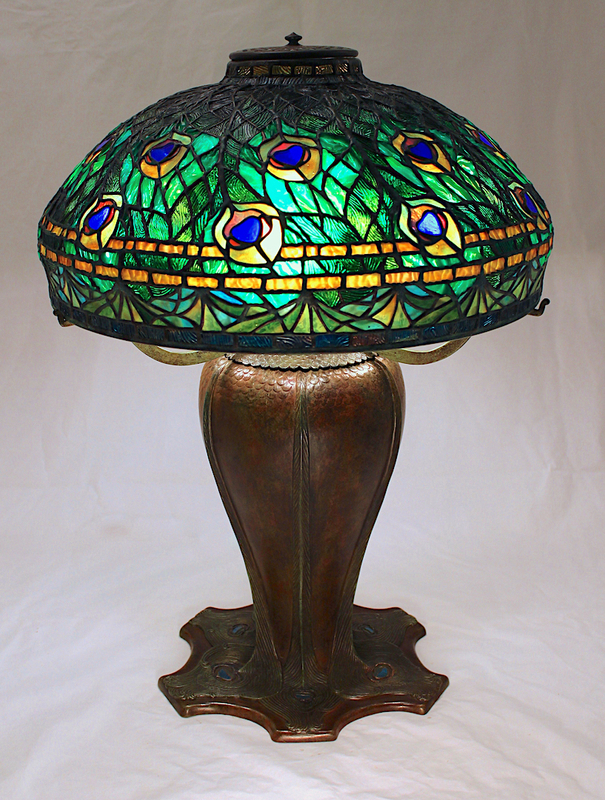 18″ Peacock – The 18″ Peacock is a highly detailed shade design consisting of overlapping peacock tail feathers swirling across the surface of the shade. Horizontal border rows provide a visual resting point to the viewer. 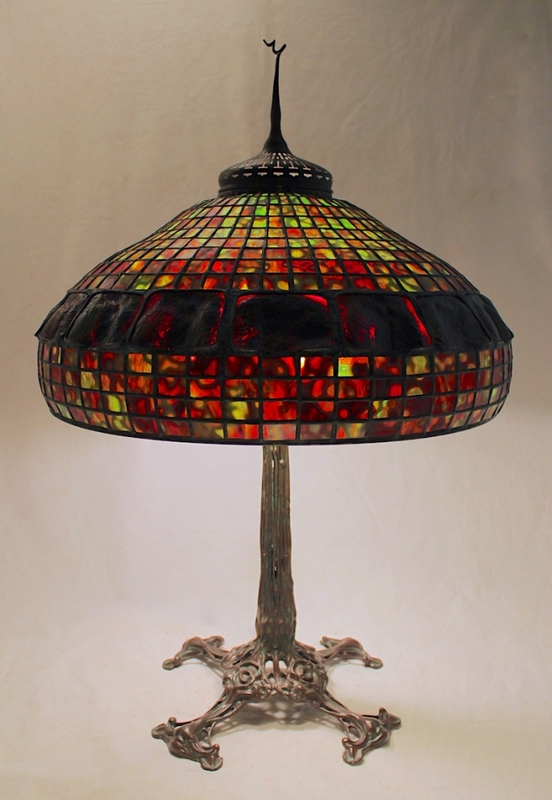 The shade skillfully blends together three different types of rippled glass. Tiffany Studios designed the Peacock base (29.5″ total lamp height) specifically for this shade. The shape of the base swells at the top, mimicking the bird’s feathered breast. 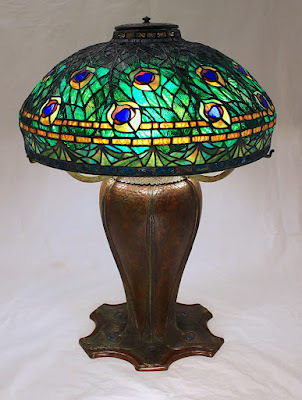 The lower portion of the base is decorated with more tail feathers, each of which has a stained glass eye at its center. 22″ Turtleback Turban – The geometric upper and lower portions of this shade are cut from heavily mottled, richly colored red & green glass. The decorative band is made from very deeply toned black cherry colored turtlebacks. The deeply saturated colors give an overall brooding effect to the piece. The shade is shown on the organic Bird Skeleton base. 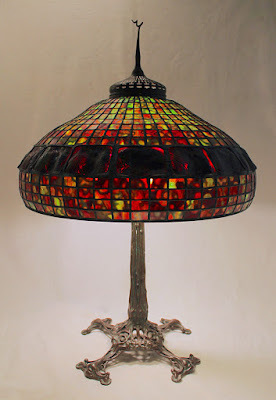 This shade will also work well as a floor lamp or chandelier fixture. A milestone in the history of lighting design, Louis Comfort Tiffany introduced Lily Table Lamps in the 1890’s, showing the world what could..
Lamp of the Week: 10″ Pony Wisteria – The 10″ Pony Wisteria lamp is the smallest member of the Wisteria family of lamps. The shade is topped..